Did you know that it takes at minimum 6-7 brand touches before someone will remember your brand? Every impression counts. Each brand touch with a potential new client, current customer, brand advocate or even those who know nothing about your brand is leaving behind an impression. It’s an impression that is going to be positive, neutral or negative. Your goal is to make each and every brand impression as positive and memorable as it can be. Consistency is key when it comes to social branding. Consistency doesn’t have to equal boring. It simply means you have a consistent representation of who you are, what you do and how you portray it to the world. Your tone may vary based on the audience you are engaging with but there should be a foundation of consistency for which you leverage to build relationships. It is important to also understand the definition of authenticity and transparency which many confuse. Being real and authentic doesn’t mean you have to share what you had for breakfast, lunch and dinner on all of the social networks. Transparency is how much information you share with different audiences. Relevancy is how you connect and are able to relate to human beings. You must be relevant to them as a human. You must treat, speak and engage with them as humans. You must speak in a manner and choose words which mean something to them. They must understand what it is you are trying to say and why. Your words and actions should inspire them to connect and engage with you. Building trust with your communities and audience via the social networks is going to take time. As you can see from the diagram below, initially your community members are going to start out as lurkers, new members and people who are “checking you out.” They are deciding if they want to engage with you. They’re deciding if they want to click, like, read, share and invest themselves in your brand. 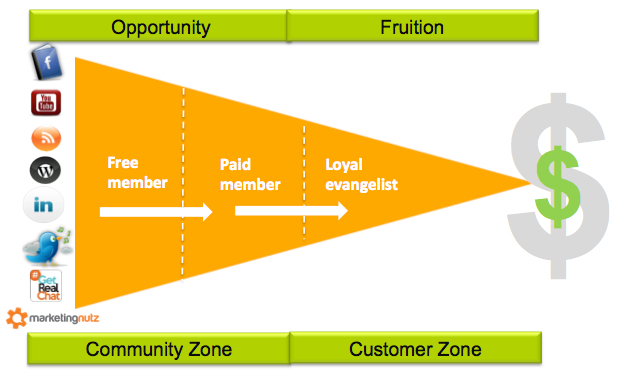 It is up to you to move them from being a “free member” to a loyal evangelist or paying customer. The combination of consistency, relevancy, value and trust are going to help ignite this movement from the left of the diagram you see below to the right. Who is your audience? What are their demographics? What problems do they have that you can help solve? How can you bring value to their life and/or business? The better you know your audience, the better you can create content and a social platform that provides relevancy and value for them. If just starting on the social networks, start by listening. The best social brands listen more than they talk. Social media is not just about talking, it’s about engaging in a relevant conversation with real human beings. Who are you? What do you have to offer that is unique? How can you provide unique value to your target audiences, stakeholders and larger community? You will likely never read a blog post from me that I do not remind you how important goals are. It does not matter how small or large your business is, how many customers you have or how much cash you have in the bank. You must set goals and objectives. Who are you now and who do you want to be when you grow up? Do you want to increase brand awareness? Increase brand equity? Reach new markets? Reposition your organization? Nurture relationships as a top priority? Knowing your goals is important to setting the right tone and tempo with all of your audiences. Make it a goal to minimize all random acts of Marketing. Don’t focus only on technology. Know the technology and tools, but focus on how you can use it to meet business goals and provide value to your audience. Minimize random acts of marketing (RAMs) as they will eat every last morsel of ROI before you wake up for breakfast each day! 4. Branding starts from the inside out. Your brand is who you are when people are watching and when they are not watching. Your brand is what your employees say and do when they are working and even when they are not working. Social media will simply reveal what is already inside the walls of your organization. The key here is to focus on inspiring and empowering your internal employees and advocates as a top priority. 5. Create a brand message architecture. Your brand is not simply your logo, colors and tagline. Your brand is everything you tweet, pin, post, do, say, and do. How you represent yourself to the outside world is going to determine your success. Don’t just think logo or colors. Think brand and message architecture. We help our clients create brand architectures that break down silos, and empower them to communicate with their core audiences in a simple, relevant and impactful way. A brand and message architecture will help you create a content marketing strategy as you will better understand your audience and their needs. Sometimes writing these things down and getting key stakeholders to agree on the core messages is a first step. As you become more advanced in this area you will want to create a “message house” or “message bible” as we often like to call it that covers message tiers from the corporate vision, value proposition, positioning statements, elevator pitches to detailed feature, benefit and even value proposition message for each of your core audiences. If you are new to branding this may sound overwhelming. 6. Leverage what you got. It is important that you leverage what you already have. If you have already invested in content marketing assets such as videos, podcasts, white papers etc., be sure to leverage them. Check out this asset inventory worksheet that will help you identify and categorize each of your content assets. It will also help you identify gaps and justify areas needing investment. Be sure to map it to your core audiences and focus on developing content assets that will help you inspire and connect with your target audiences and markets. Once you have an idea of where you are going it is important to create an editorial calendar so you develop a healthy rhythm for your communication with your priority audiences. Use this editorial calendar template to get started. 8. Refresh does a brand good. Digital brand execution does not always = same as offline. Don’t simply take your 1999 corporate collateral and split it into 2000 tweets to be auto scheduled for publication over the next year. Instead, leverage what you have but start fresh. Keep the focus on your audience, their needs and how you can provide the highest value possible to them. If you have not updated your digital assets in awhile it is likely that they will need a refresh. Taking the time to organize your brand architecture, deciding on a consistent look and feel for both online and off line will deliver a high ROI for both the short and long term. As you make progress in determining how your social digital brand is going to be executed, start staking your territory. Grab your brand name and relevant product names as appropriate on the social networks. If you find that someone or another brand has grabbed it before you and now has your brand name Twitter handle or YouTube account, you will need to negotiate each social network account individually. Make sure to have your trademark filing records and other legal documentation ready for submission to the social networks as needed. 10. Choose a consistent social network brand name if possible. If possible, choose a consistent social network brand name. Even if your favorite one is taken on some networks it may be good to select a different one that you can have across more of the platforms. When you see a new social network launch that looks like it might gain quick traction, be sure to grab your account and name so you won’t have to worry about it later should someone else or another brand grab it. 11. Use the same photo or logo. For personal branding, it is important to get professional photographs taken. Remember your smiling face is likely the first impression you are going to make when people see you on Twitter, Facebook, Instagram and the numerous other social networks. Select 2-3 top photographs to use consistently across the social networks. This will help you build your brand and consistency. You want people to be able to recognize you regardless what platform they see you on. If they trust you on one platform this will help build trust further by connecting with you on additional networks. For business branding, create the proper size logo images for each of the social networks. Take the time to do these right. Don’t force fit the wrong size into an avatar on a social network. Make sure you can see the entire logo or image. Keep the image simple, clean and representative of you and your brand. 12. Less is more. Focus on depth and connection, not just pretty pictures. Less is truly more when it comes to social branding. You don’t have to spend tens of thousands to create a social brand. If you are new to this, it is more important you focus on your audience first and your brand and message architecture second. Creating a fancy Twitter background and Facebook cover image is going to do very little for you if you don’t know your audience and how you are going to provide value to them, inspire them and connect with them in a genuine way. Focus more on content and connection than you do on pretty pictures. The pretty images will come in time and they will mean so much more to the audience once the words behind them have meaning. No need to cram every social network address on every social profile image. If you create good content, people will track you down and find you because they find you and your content relevant. You don’t need to blast your urls in their face at every opportunity you get. Many people will see this as spam and be turned off vs attracted to you and your brand. Remember you are communicating with human beings. Just as you want to connect with the human beings within your social communities, they also want to connect with you as a human being. People buy from people. They also communicate better with people than they do with only logos. Share the inside of your organization with your network. Share the human aspect, the events, parties, conversations. 14. Don’t fake it until you make it. Yes, you should be confident and be who you want to be tomorrow, today. However, this does not mean that you should focus on fake social proof, over spin on social vanity metrics to fake people out. I have written much about this topic. 15. Don’t be afraid to ask for help. If you don’t know how to work in Photoshop, don’t waste the next year learning Photoshop so you can simply create a new or refreshed logo. Delegate the tasks and work that does not align with your core competencies or where you want to grow your business. When working with outside partners, agencies and consultants, take your time. Don’t settle on the first one you find. Look behind the social glass curtain. There are many who are “faking and trying to make it” and if you only look at their pretty Facebook cover image you are likely to waste a lot of money. Know your goals and hire partners who can help you achieve them. If a 3rd party wants to jump straight to developing your website or Facebook cover image without knowing about your brand and your audience, run the other way. Slowing down to speed up in this area will definitely pay off in both the short and long term. 16. Take them on your journey. Becoming a social brand is a journey, not a destination. You are going to learn, grow, evolve. You are going to fall down and hit your head, hard. How you stand up, wipe off your knees and keep moving will determine your success. Use video, photos and podcasts to tell your story. Take your clients, partners, and social community members on your journey as you grow. If you share your ups and downs, the members of your community will also celebrate with you when you win. Why you ask? Because they will know they were part of what built you. Be humble. Be real. Be you!